It’s very peaceful at Delancey right now. I’m going to try to remember what this feels like. Wait. 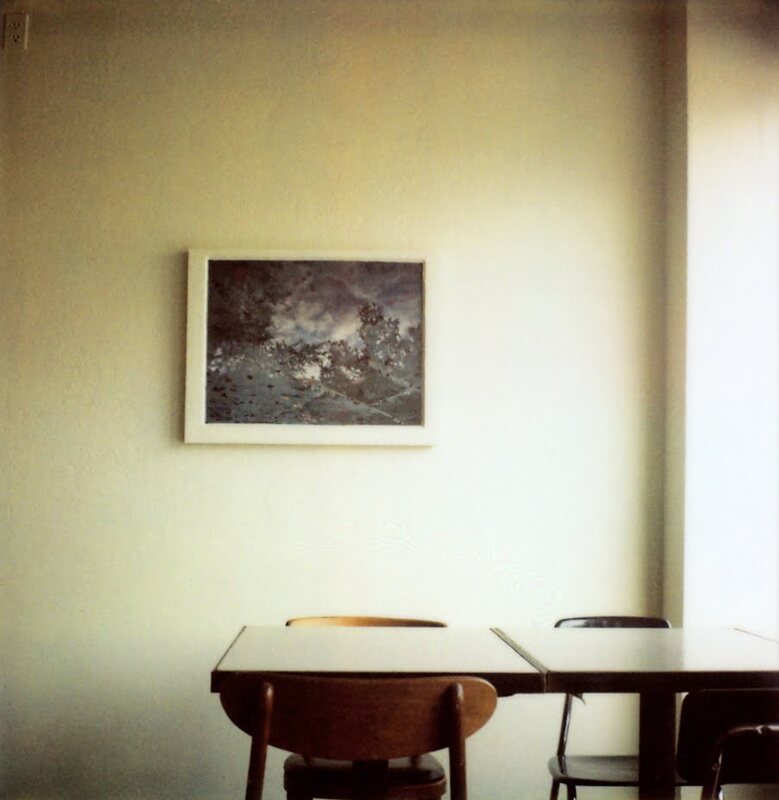 Is the art in this photo crooked, or is it just me? Maybe my eyes are crooked. Anything is possible. Delancey opens tonight at five. There’s no signage outside the building yet, but that’ll be fixed soon. It’s at the top of our to-do list. In the meantime, for those of you in the Seattle area, maybe this map will help you find us? Our address is 1415 NW 70th Street. (It might be helpful, too, to know that we’re one block north of Ballard High School, directly across the street from a bar called Tarasco, and right next to Honore Bakery.) Like our signage, our web site is also still a work in progress, but our phone is up and running, and I consider that a small victory. The number is 206.838.1960. If you would like to reserve a table, please note that we take reservations for parties of six or more only. We’re open from Wednesday to Sunday, dinner only, from five to ten-ish. A number of you have asked about our menu, so I should probably tell you about that, too. It will change often, depending on the season and what we can buy from local farmers, but this is the one we’re opening with. The scan is wonky, I know, but bear with me. If you click on it, it will enlarge to a much more readable size. Eventually, we’ll get a stamp with our logo and bang it down at the top of each menu with some nice, orange-red ink, but until then, I’m writing the restaurant name by hand. It’s kind of a pain, and sometimes my mind wanders midway through the stack and I lose my ability to spell, but it makes me happy. So, I should mention, do chilled peaches in white wine. I made these on a whim last week, tossed them up onto the menu, and they might now be my favorite dessert. (For this week, at least.) You just take some peaches, slice them, toss them with sugar, and then dump a bottle of dry white wine on top. Then you put them in the fridge for a while. You can serve them after only a half-day or so, and they’ll taste fantastic, like a very classy, grown-up version of peaches in light syrup. But after a whole day or two, they start to go translucent, and then they’re even better: thoroughly soused, barely sweet, cool and refreshing, almost dangerously easy to eat. (I did not mean to make that rhyme. Or half-rhyme. Whatever. Swear.) Before summer ends, you really should make some. I insist. Especially if you live too far away to come to Delancey and let me make them for you. I’ve tried this method with a couple of different wines, but my favorite is Domaine de Pellehaut “Harmonie de Gascogne.” It’s on our wine list, and it’s hard not to love: crisp and light, a little grapefruity, not too expensive – and perfect, perfect for peaches. 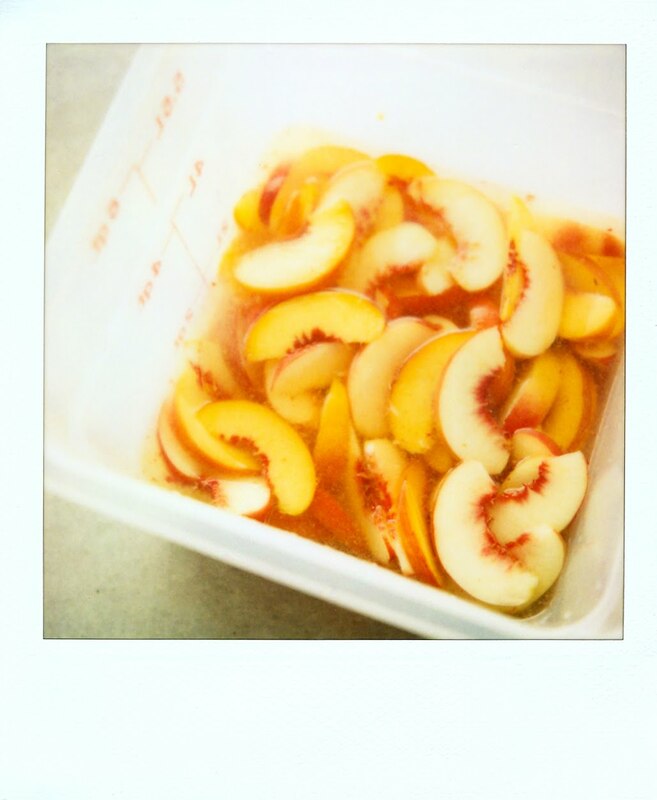 And about the peaches themselves: be sure to choose specimens that are firm and meaty, not watery or mealy. Slice the peaches thinly. (I get about 16 slices per peach.) Combine the peaches and sugar, and toss gently to mix. Add the wine, and toss gently again. Taste, and adjust sugar as needed. (Brandon likes them a little sweeter than I do.) Cover, and refrigerate for several hours – or up to a few days, if you want. 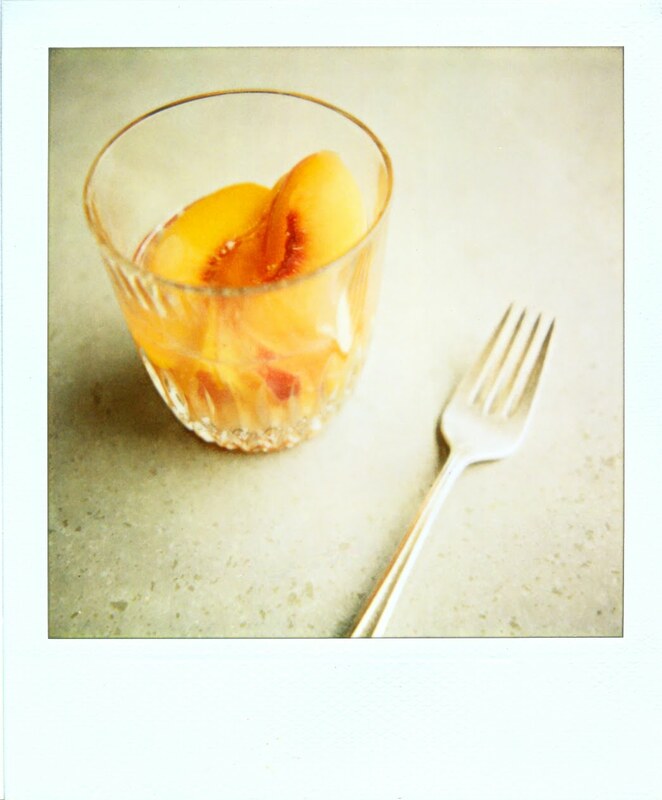 Serve the peaches cold, in a glass or shallow bowl, with a small ladleful of their liquid. Eat the peaches with a fork and then drink the liquid left in the glass. Wow the big day is here! The restaurant baby is birthed. You guys will do great. Good luck and congratulations!! Congratulations on the opening! I will be heading that way soon. I can't decide between the Crimini or the Zucchini Anchovy. All sounds delicious! Seattle has a new gem- Delancey! Good luck tonight! I am sure you will be a smash hit! Best of luck to you tonight! Another reason why I want to visit Seattle soon. Congratulations! Hope all goes well on… opening day! I love your blog and just got your book on Monday (my birthday!) what a gift you are. Can't wait to try the peaches – yum. Wishing you all the best with your resturant and can't wait to try out more of your recipes! Congratulations! oh my goodness, your place looks AMAZING! Congrats! i am SO hitting this up for Date Night! Congratulations on the big day! My sister and I are driving up from Portland next weekend to come to Delancey – and we're so excited. Sending you luck (which I'm sure you don't need) and maybe a little peace and calm too. How exciting — best of luck to you and Brandon! After I read your wonderful book, I feel like I know both of you. If only I didn't live too far away to come by and eat at Delancey and meet you both….so glad you are posting recipes again, too — must give this one a try. Congratulations! It's been so lovely to follow Delancey's progress here and through your twitter feeds. When I saw this post's title in my Google reader, I swear my heart swelled with pride. Go get 'em – we're all pulling for you. Menu looks delicious! And so inexpensive. I bet you could safely bump the prices a buck or two on the 'za. I'd pay it, happily. Menu looks amazing. Good luck! Wish we could be there! Good luck! Congratulations and many best wishes! I wish we lived in Seattle! Good luck with everything tonight And have a ball!!!! Can't wait to get down there and try some pizza. Have fun tonight, congrats on the opening! and, well, looking forward to a day when i'm actually in town and can visit. A visit to Delancey is at the top of my list for my Seattle visit next month. 🙂 Can't wait, and congrats to you both! Congratulations – wish we lived closer and I could come for my birthday dinner tomorrow – I'm sure you'll be super busy though! It all looks delicious and those peaches sound so good! I used to live in Ballard and can picture where you are talking about! Although I now call Indiana home, I will look forward to stopping by when I'm out visiting friends in your area. It was always a treat for my one of my roommates and I to try out the local eateries around Ballard – supporting the local and smaller eateries instead of opting for chain restaurants. peace is overrated. you'll be cooking for a room full of hungry people. it's chaos. it's an honor. a big congrats to you and brandon! This might be a silly question, but are you supposed to ID people who order this dessert? It seems like the peaches would get rather boozy after soaking in the wine for so long. oh, I wish I could come! That menu looks fantastic! Congratulations! Enjoy tonight! I hope you continue to find those beautiful quiet and peaceful moments in your day as they seem to suit you quite well. I'll be thinking of you at 5pm!! Best wishes! Good luck tonight! Delancy is on my list for the next time I visit Seattle. Can't wait. I'm not sure if my eyes are crooked, but it looks like the framing of the photo may be askew, so the picture on the wall could be just fine. The menu looks wonderful. Simple. I love that, not least because it indulges my fantasy that I could open a restaurant myself someday. For now I will enjoy the experience vicariously, through you and Brandon. Good luck tonight and congrats on the opening!!! I wish I had this yummy peach recipe a couple months ago when I had ubers of peaches in my kitchen. I'll have to go out and find some just so I can try this. Peaches and wine, does it get any better than that?! They are simple to make and get rave reviews wherever I take them. Good luck with your restaurant! I'll be thinking of you,knowing that your opening night will be wonderful – as will all the years to follow. I'm so sure of it. Looks like you are doing everything right. Congrats to you. How exciting! Congratulations and best wishes to you both! I wish I were in your area so that I could try some of that delicious sounding food. Hopefully, some day I'll get back there…..
Congratulations, Molly! My husband and I are looking forward to eating at Delancey very soon. I'm so happy for you both – have a great day, hope to see pix of the opening! Congratulations! We are wishing you all the best, I am sure it will go beautifully! Congratulations!!!!!!! How exciting! The menu looks perfect. Clean, fresh-ingredient focused and appealing. Good luck! oh goddamn i really really wish i could hop on over for some of those peaches. preceded by pizzas and that arugla starter. i don't know you, i have only been reading this blog for a criminally short time, but i sincerely wish you so much luck, i feel sure you're both onto a winner here! best best wishes from Dorset, England. you're killin' me. can't wait to visit from portland. Speaking of rhyming, I bet those peaches would taste lovely with just a bit of fresh thyme sprinkled in. Yay! Good luck I'm sure all your hard work will pay off! FYI I'm currently reading your book and yesterday I was so engrossed that not only missed my stop on the train but also the next five. Normally I would have sworn out loud except for the fact that I was so thoroughly entertained by your writing. So thank you. The Bouchons au thon for lunch today were brilliant! how fantastic!! Sending happy happy thoughts your way for a successful venture 🙂 I look forward to reading all about it! Good luck with the restaurant opening. I'll be coming over from Poulsbo soon! This is all so exciting! I am loving these updates. Makes me want to open the bake shop of my dreams! All the best tonight. Great idea with the peaches. If I make it out west soon I will sure to make a stop at Delancey. Can't wait to come try! My sister just moved back to Seattle and cannot wait to try out your place next week. I'll just have to live vicariously through her. So many good wishes going your way – you two both deserve it. If I haven't told you before – I LOVED your book! And those peaches – in my Italian household that's what we ate for a typical dessert in the summertime. Next time I'm in Seattle, I'm eating at Delancey. Congratulations and all the best for a great opening. Congratulations! May the droves come in perfectly spaced intervals. Luck's on your side. Wishing you all the best for opening night! It will be a success! That table in the top photo is where we sat for the soft opening last Friday. I'm really excited to get in there and try more of the pizzas. I wouldn't go out of my way to say it, if I didn't mean it–this is the best pizza I've had in Seattle. Thanks and welcome to the neighborhood! Beautiful photo of peaches in wine. It's amazing how beautiful a simple image can be. THE VERY BEST OF LUCK TONIGHT. I KNOW IT WILL BE GREAT. THE NEXT TIME I AM IN SEATTLE – I AM THERE. Wish I lived closer so I could visit. Sounds delicious! Good luck tonight. Best of luck. Will be coming in soon! The menu is so simple. I love it!!! I wish I lived in Seattle to come visit. Good luck, I'm sure everyone will love it! congrats, best wishes, and good luck! Totally drooling over the menu and oh, those peaches. Good luck tonight – I predict smashing success! I have been following for a while, and am so happy for you that your restaurant is launched! Best of luck, and if I am ever in Seattle, I will be there for pizza and chocolate chip cookies! I'm a new reader, but I wanted to wish you luck tonight! I'll be thinking of you tonight! This is so exciting!! I live on the East coast in Boston, but if I was closer, I would be there cheering you on and of course enjoying your amazing fare. I am sure you will have a line of customers waiting outside your door. Wishing you the best of luck and many, many happy dinners ahead! I'm so excited! We even live roughly in the neighborhood, so if we're lucky enough to survive the crushes of people who'll be lined up every Wednesday through Sunday, we'll no doubt make Delancey our regular haunt. Congratulations on your restaurant! Many happy years to you. At last I've made my way to your blog, and now regret not doing this sooner. PS – the artwork IS crooked. I'd be happy to nudge it ever so slightly square for you. I adore the hand-written Delancey. I really wish I could be there to eat tonight! Good luck! Sounds great. Best of luck tonight. We'll eat the peaches on Friday and see you in January! Love love love the simplicity of your menu! Everything looks fantastic and I can't wait to try it. Good luck, you won't need it because your heart is so in it…have fun! Best of luck tonight at the opening! It looks wonderful. I live in Vancouver and next road trip down to Seattle, I can't wait to stop by your restaurant. Congratulations! Hope the first night goes swimmingly. I remember reading about a similar German treat wherein you prick a peach all over with a silver fork (which seems a very fairy-tale type detail), place it in a specially-made extra-large goblet, and fill with sparkling white wine. The bubbly wine makes the peach fizz and spin around in somersaults. And when the show is over, you get to enjoy the boozy peach (and peachy booze). too far away to come to Delancy, but staring at a bowl of peaches on my counter right now! Best wishes for opening night–so very, very exciting for you both! Looking forward to visiting the restaurant soon! Congrats on opening up your restaurant! If my husband and I are ever in the area, we'll be sure to stop by! I've been wanting to visit Seattle, but now I'm simply dying to! I recently finished your book, and it's inspired my cooking this summer. Thank you! oh your menu sounds gorgeous, i love the dessert section as well. As I write this you've been open for 20 minutes – WOW – all the very best – your menu looks awesome – I love the simplicity of it, but such a unique and delicious combination of flavours. I live in Auckland so can't pop in but if I ever pass through Seattle, I'll definitely be paying you a visit! congratulations! that menu looks amazing (both the food and the design). can't wait to come eat there one day. Happy Grand Opening! I wish I was there to order at least one of every single thing on the menu. Tonight will be perfect, I'm sure. Congratulations to Delancey, and to both of you. Things look pretty spiffy to me… crooked eye or not. Peaches in wine ?! I can't wait to try it. And when I finally get out to the West Coast, I will be stopping in to sample your menu…. Umm, it's my dad's birthday too. But that was only second on our list. Us Eastlake and Ravenna-ites are eagerly anticipating our first visit. Until we make it in, we will tide ourselves over with that amazing dessert recipe. Congratulations! How wonderful to have all your hard work come together. I can't wait for an opportunity to visit my family out on the West Coast and stop by for a bite! I just read your book and thoroughly enjoyed every word/morsel. I love the way you write and express your love of life, humans and food. I made the Banana Bread with Chocolate and Crystalized Ginger tonight and it is fabulous. I wish I still lived in Seattle so that I could eat at your restaurant. Best wishes for your opening tonight! Wish I could fly from Arkansas to be there! I hope your opening night is a success and I wish I was there! I am definitely making the peaches since I am way too far away to have you fix them for me. Congratulations on the opening! I suppose out here in the Eastern time zone, you're still in the thick of things … Best wishes! Congratulations, and I know you will do great! I saw your interview in Bon Appetit magazine, and it was wonderful! I can't wait to hear how it all goes! When I get up to Seattle, I will definitely be stopping by! Good luck to you and Brandon, I know that your restaurant will be overflowing every night! Love the menue, love the recipe, would love to know what wine you are using, I am very timid about using wine. I. Want. To. Go. To. Seattle. Now! I wish we lived in Seattle and could come by for a pizza! The Zucchini-Anchovy Pizza sounds great. The menu looks wonderful. I love the handwritten detail. I hope you have a great opening night!! All day I kept remembering, Delancey opens today. Super excited for you two. Hope everything went as smoothly as possible! This is my first time commenting, but I've been reading for a while and simply love reading your work! Break a leg tonight! Can't wait to venture up from Capitol Hill and bring a legion of hungry pizza eaters with me! PS. I'm eating a peach right now and am so sad I have no wine available. Sounds worth the trip to me! I hope that you and Brandon can control the mayhem! Let there be pizza (in Ballard!) Best! Oooo…wish I had read this before turning a case of peaches into jam earlier this week. Haven't posted the peach jam recipe yet, but I have a blueberry rhubarb one up that I suspect you'd like: http://www.mmmmmama.blogspot.com. Congratulations-so much work to pull something like this off!! yeah! I hope to get up there from SF soon, in fact looking for a place to do a reading for my soon to be out book, My Nepenthe if you have any ideas. The peaches look divine-I've tried something similar with Proseco, and it's pure heaven, topped with a little fresh peach sorbet would be over the top. Congratulations! I'll conveniently be in Seattle next week for a wedding, and you can be sure I'll stop in for dinner! I was thinking of you today and wondering how you were faring…and am so pleased to hear you sound calm (you must really have been, to be posting!) and more than ready. Congratulations with the opening! I must also say that I kinda love the charming handwritten “delancey” on the menus even though it might cause quite a hand cramp. Just finished the chapter of your book where you're back in Paris after your dad's passing. I should add that I wept at that chapter on a packed peak hour train – you commemorate him beautifully. Look forward to news of your restaurant craziness. 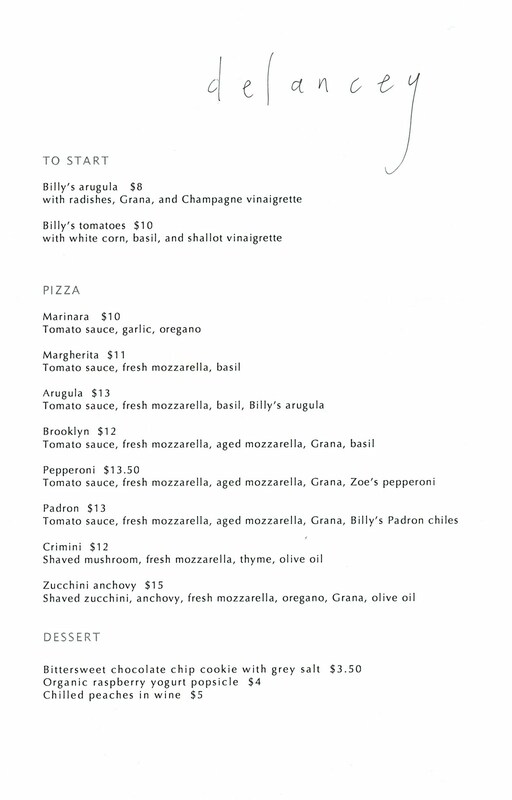 The menu looks great – wish I could have been there last night to try out the pizza. When I travel to Seattle you will definitely be a must-eat. Good luck! congratulations! the menu looks divine. i am determined to get to seattle, and mainly delancey, at least before spring; i can't wait. molly, that dessert menu has you written all over it. i love it! It is all so lovely!! Congratulations and good luck! If I'm ever in Seattle again I'll be sure to visit Delancey! Best of luck with your first week! Everything on the menu looks lovely and delectable. Thanks for posting this recipe for those of us enjoying the sights from afar. I wish I could go to Delancey! Waaay too far away. But I love seeing your lovely handlettered menu. Now I want pizza, in a serious way. Congratulations on seeing this all come together so beautifully! I can't wait to go – I'll definitely be there before the summer is over! Especially since last night I had a Cafe Lago pizza. Now I”m in good-pizza-addiction mode. And the peaches sound fabulous. I hope it was a great night! I wish one day I visit your rstaurant. Congratulations and the best of luck! Cleaning crew will come in handy after those long hours! My grandfather made peaches and wine when I was a kid, but he used Gallo and canned peaches (yikes)… You make it look delicious and it still reminds me of him. Please don't judge that we were given alcohol at such a young age – we're Italian! Moly, Congratulations – I admire your effort, creativity and confidence!! Thanks for sharing your recipes; I am sure you have fantastic karma. My daughter and I will be driving to your friendly city from Vancouver, BC, to taste your menu. Can't wait to hear about your opening night, I know it will be a grand success. We'll be having Peaches in Chilled Wine at my house this weekend. Molly I so wish I could go to your restaurant to taste all those goodies on your menu. I love your blog. I've just started reading your book. I am love love loving it!!! Good luck with the restaurant! congrats on the opening! I live in seattle, and I look forward to coming by soon. Congrats on the restautant guys, and thanks for the great desert idea. Seems like it would be pretty hard to go wrong with a peach and wine combo. Continued success, and keep us posted on how things are going! Good luck. I'm excited to come try your new place. You have no idea how happy it makes me to see peaches in wine on a menu! This is something we would eat at my grandmother's house in Rome almost every summer day at the end of the mid-day meal. I have it all the time when peaches are in season, and I tell people about it constantly. Most of those people look at me like I'm crazy until I make it for them. Break a leg!!! Wish I could be there. A reader from NY. Good luck on the opening. I wished we lived in Seattle but we are in D.C. I am telling ALL of my friends in Seattle to check you all out. eek-how exciting!the menu sounds perfect. can't wait to see/hear all about the opening! Oh, I wish I could come! Congratulations…the menu looks superb and I love that it's been kept so simple and seasonal. I will give the peaches a try for sure. Thank you for making our thrid anniversary date so special. My husband and I visited your lovely resturant tonight and the food was AMAZING!!! I am in love with your rasberry yogurt popsicles. I feel so lucky to live in this area where I can come back again and again. Best wishes to you and Brandon! So many congratulations to you both on making it to opening day. I'm visiting Seattle in October and can't wait to come and try whatever is on the menu then. oh man, i'm sure these would make a beautiful bellini. And it makes me envy you West Coast residents even more! Sending you lots of love and as much sleep as you can find time for these days. Hope the big deal went off without a hitch! Those peaches look divine, the perfect mid-August heat dessert. Hope to visit Delancey myself whenever I can get to Seattle. I hope you get some much needed rest sometime soon Molly! In the meantime try to revel in the funny delirium that comes from lack of sleep. The menu looks terrific! Best wishes! Just flew in to Seattle from Boston on my annual summer visit and received an e-mail from my friend and fabulous foodie (www.palatetopen.com) that I must check out Delancey, so she can live vicariously through me, which I did. And it was simply lovely. Wish you the best of luck, although I doubt you'll need it. Everything looks and sounds yummy. We will have to pop in this weekend and try. I wished I lived within driving distance of your place – the menu looks amazing – I may steel your zucchini pizza for my dinner tonight. Best wishes to a smashing success! I live in Ballard, and I can't wait to come have dinner at Delancey! Congratulations on all the hard work. It looks amazing! I tried your recipe but I used pears and white grape juice. SIMPLY HEAVEN! Thanks for sharing! I hope the opening was amazing! Can't wait to read all about it! Oh yum! I have to try that with peaches. I do a similar recipe with plums and Shiraz, then I stick it in the freezer for a couple of hours and it makes a super yummy slush. Molly, I do a very similar peach recipe and add a few crushed basil leaves to the peaches and wine mixture … the essence of summer! Congratulations – Delancy is off to a fine beginning. Oh wow. I wish I could come to Seattle and eat your food. It's on my to do list. Have a wonderful, wonderful time. Can't wait until you do the Gluten- Free Pizza mentioned by Shauna! wow, Molly, you've a real trooper — I wish you the best of luck. I hope that the opening was a terrific success! If I were there I'd have the Billy's Arugula, the Crimini Pizza, and the Raspberry Yogurt Popsicle. YUM! Thinking of you guys! Congratulations, Molly and Brandon! I cannot WAIT until my next visit to Seattle, when I will most certainly be stopping at Delancey for dinner! Everything looks mouthwatering and delicious! And I can't wait to dry those drunken peaches! Just wish I was closeby to come to your restaurant!! It all sounds so yummy! Back in 2004, on August 12th, your post ended with the words “Serves one”; from that to here, in a blink of time — congratulations & break a leg. your menu looks amazing!!!! so exciting!!!!!!!!!!!!!! I made the peaches immediately after reading this. We had them with some nice vanilla ice cream the first night and then ate them at the beach the next day in little cups. Amazing! Used a Sylvaner-it was perfect. I rushed out to the market to buy peaches as soon as I read this post, and used a nice Spanish albariño (my summer wine of choice). They were simply wonderful – this is my new favourite summer dessert. Congratulations on the opening, everything sounds delicious! this is so exciting! (do you still read comments after, oh, 150?). I'm coming down to Seattle from Vancouver next week and I am definitely going to try and make it to delancey for dinner… even if it means I don't get home until 1 a.m. Whatevs. But I hope I hope you still have peaches in wine for dessert. Mazel Tov, Molly and Brandon. Wish I could stop in and eat a thing or two. I just moved from Seattle to Okinawa, Japan and haven't regretted it until now. I want to go to your restaurant! Can't wait to try the recipe. Menu looks so fantastic! So do the peaches…mmmmm. I think everything you touch turns beautiful – great work you guys! Just got home from my first dinner at Delancey. Everything was exceptional–and completely worth the 30 minute wait. Best wishes for your continued success! I know that this is really off topic, but I just finished reading your beautiful, beautiful book. I've had it for a while, but I've been drawing it out, because I really didn't want it to end. It was everything I need in a book. Your voice was resonant throughout, and your stories poignant. If ever my husband and I travel to Seattle, Delancey is on the top of our list! SO?? How did it go? How was your first week with Delancy? Dying to hear, please let us know it was a tremendous success!! Love it!! I can't believe you're handwriting the logo on every menu yourself. So impressive – definitely gives the restaurant a more homemade feel. I can't wait to try it when I'm in Seattle! Congratulations! Any chance you'll be able to offer gluten-free pizza crust in the future? Good luck! Everything sounds wonderful. I will be dreaming of those peaches tonight. YUM! Mmm. Congrats on all your success. I grew up eating peaches in white wine with my father- he's Italian, from italy. Best of luck with opening night! Congratulations. I can't wait to visit when I'm in Seattle in September. And the peaches in wine, whether white or red wine, is my favorite! Molly…Brandon… are you still alive? The menu looks gorgeous! Thanks for the recipe so those of us in NYC can go get a slice and make this and pretend we're visiting on the big night. hope all went swimmingly! Sounds like a perfect dessert to follow my dinner of peach caprese salad. Thank you for the chilled peaches in wine recipe. I prepared this for a BBQ and they went perfectly after wild alaskan salmon and farm share vegetables. Now I am obsessed with finding the perfect chocolate chip recipe. Will you be posting your bittersweet chocolate chip cookie with grey salt online? If not, can you let us know if the grey salt is mixed in the cookie dough or whether it's sprinkled on top? And what brand of chocolate? Thanks! Molly, I've been reading you for years, and this entry made me tear up. There you are. You're open! You're giving out your phone number! You're drawing us a map! I'm so happy for you both. Congratulations and good luck. Good Luck with your latest venture. Also, made the peaches – AND they are my favorite dessert this summer! Thanks and beijinhos (kisses) from sunny Portugal. The peaches sound amazing, and this caught my eye because I just saw a bunch at the farmer's market. Will try soon. I've just come across you on the times online – one of the top food blogs! Those peaches sounds AMAZING! Good luck on your new adventure! I just read your book and so (of course) went to your blog and viola'! a new restaurant in a town we can visit next year. See you soon. Congrats on the restaurant!! I don't know how these blogs work very well. I wanted to tell you I made the braised pork from your entry on 02/16/06. It was ridiculous!! We have been on a pork kick lately. Thanks!! Gosh, I turned away from your blog for a week and you went and opened the restaurant. Congratulations! I will definately be by for a delicious meal, soon. Love, love, love fruit in my wine. It makes me not whine. These peaches are fantastic by themselves, but have you tried spooning them (and a bit of the juice, of course) over a slice of spice cake? Oh dear sweet goodness, it was the best dessert I've had all summer! I have heard from a couple of reliable sources that your pizza is amazing. I cannot wait to try it soon. I went to Ballard HS and would have literally done anything for delicious pizza at lunch. If I bring my copy of your amazing book in when I visit would you sign it? I read it twice while in Maui last spring. Is that weird? Can't wait to try the popsicles! Congratulations and good luck! I'm sure you'll do very well, if those photos have anything to do with it. I actually work with Chef's Diet, and we prepare healthy, well balanced meals whose fruits and vegetables are picked at the peak of freshness, and meats lean and tender. We create our meals daily and deliver them straight to your door! If you ever find that you might be too busy to shop and prepare your own meals, this could be a very helpful program. If anyone is interested, visit http://www.mychefsdiet.com for more info! Please update us when you can on how the first 2 weeks went! I have been following your blog for some time. i am bummed. i live in nyc and have been dying to be in seattle to try delancey. i urged my friend to go tonight and she said the service was terrible and that she won't go again. i guess her waitress was rude. say it ain't so! is all i can think. i'm still imagining the best and will make a trip when i'm out west. The crimini pizza was amazing last night; the wine was great too. The wait was a bit long – wish you had some sidewalk tables! The temperature was sweltering inside. I hope you get a sign soon! I found out it without a problem. But, a passerby asked me where to find Delancey while we were standing right in front of it. I would love it to be a Ballard secret, but I'd hate for you to lose business because there's no signage! So sorry for being away from this space for so long! We've been working from 9 am to 1 am almost every day. It's nuts. But I have new pictures for you, and I swear, I WILL find some time to post them soon. Whew. But to all have wished us well, thank you! So much. This process has been harder than I could have ever imagined, but the opening has gone pretty well. (As well as I could have hoped, I think!) We still have some work to do to help the food and service run more quickly and smoothly, but we learn a ton every day. And our customers have been wonderful! We are so, so grateful for them. Shratter, the cookies are closely based on this recipe. Hope that helps! Ballardisthespot, I would be happy to sign your book! Of course. T-i-f-f-a-n-y, I'm so, so sorry to hear that your friend was unhappy with the service she received! That's awful. I would love to hear more about what went wrong, and I would like to try to fix it somehow, if I can. She's welcome to contact me. Anonymous, we're working on signage, I promise! The reason we don't have it yet is that we've had a hard time deciding on a typeface/logo, and now that we're open, it's even harder to decide, because we haven't had time. But I think we've finally started to settle on something, and now we just need to get it made and installed. I know you're out there,just hoping that it's not too overwhelming and you just remember to breathe. I've opened a few a-little-too-sucessful-from-the-get-go restaurants and I know what it's like. You don't want to look a gift horse in the mouth but it is a bit too much and you just want to be able to think about something other than the monster that you've created. A wonderful monster, but a monster nonetheless. Hope you find the time to check in soon. Great menu and your prices seem fair and adequate for these economic times. Your prices are much lower tha Mozza's and your pizza is just as good I am sure. I have a peach tree in my garden in Italy and my friend Stefano took a few and peeled them and soaked them in white wine. They were not ripe and took some time to soften in the wine. Buona fortuna. Siete bravi e il ristorante sara buonissimo. The peaches were a perfect dessert last night after a caprese salad. Thank you, and congratulations! Wow. What a place. And what a pizza. And salad. And cookie. Wow. Thank you for such a lovely dinner. Sitting at the bar and watching Brandon lovingly make pizzas is the place to be. It looks like a lot of work (I mean, you guys were hustling! ), but it pays off in the guest experience. I hope people are being as good to you as you are to them. Can't wait to come back and try the pizza with chiles. Mmm. Definitely worth the trip from Portland. I just wanted to give you some encouragement. A couple of girlfriends and I went to Delancey last night and had some fabulous food. Yes the wait was a bit long, but we realize it's because people love to sit around and chat and drink wine! That's the best part of going out to dinner! We had the meat platter with pickled carrots (I'm attempting to duplicate them right now) and the Crimini and Brooklyn pizzas. The hostess was kind enough to send us off with a cookie as a consolation prize for our long wait, but even without it our evening was lovely. Thank you both and keep up the good work. Made the peaches last night with Vermentino. Fantastic. Thank you for that. Wow! A pizza restaurant! You've inspired me to make some at home for friends…. Loved your book, particularly the prunes and orange from your dad. We now make it all the time! All the best for the restaurant. We will make a booking if we are in Seattle! The peaches are heaven. Thank you my dear. can't wait to drive across town and try it. congrats on the opening! and one of my all-time favorite desserts…although when i've made it it's peaches with moscato. grown up grape juice. yummm. My head is still swimming deliciously from the peaches, post divine pie. Thank you! I made this simple and delicious dessert right after you posted the recipe. They were wonderful and my husband nicknamed them “Plowed Peaches” for the very winey sweetness that developed after keeping them in the fridge for a few hours! Thanks for the recipe. I found your blog off of someone else's blog, and as I was reading about your restaurant and looking at the photos, and seeing what's on your menu, I was thinking, “Man, I wish there were restaurants like this here. Delancy sounds so good.” And then I read further on in the post and I found that, not only are you in Seattle with me, but you're in my neighborhood! Wow! I can't wait to come by. Tomorrow! Yay! Keep up the good work! I roasted some fresh tomatoes using the recipe in your book and added them to my chili last night. Delicious! Seriously, seriously great value wine. At only $7 a bottle, buy a case of this one. It's quite complex for a “cheap” wine, and it's sure to please just about anyone. Despite it's crisp acidity, it's medium-bodied, which is surprising in the mouth. Very balanced, and sips nicely by itself, or with food. What a nice surprise! Really loved this wine.It gives ultimate pleasure with Cuban cigars which i buy from online Cigar Shop. Congratulations! Everything sounds delicious, and I can't wait to visit next time I'm in Seattle. Will you please relate to Brandon that Zoë the cellist from his Oberlin days is glad that you have “Zoe's Pepperoni,” and that I wish you both good cheer? These look sensational! I can't wait to try them for my next dinner party! Hippie vibe, homemade pizza and wine. Mmmmm….